Well here it is! 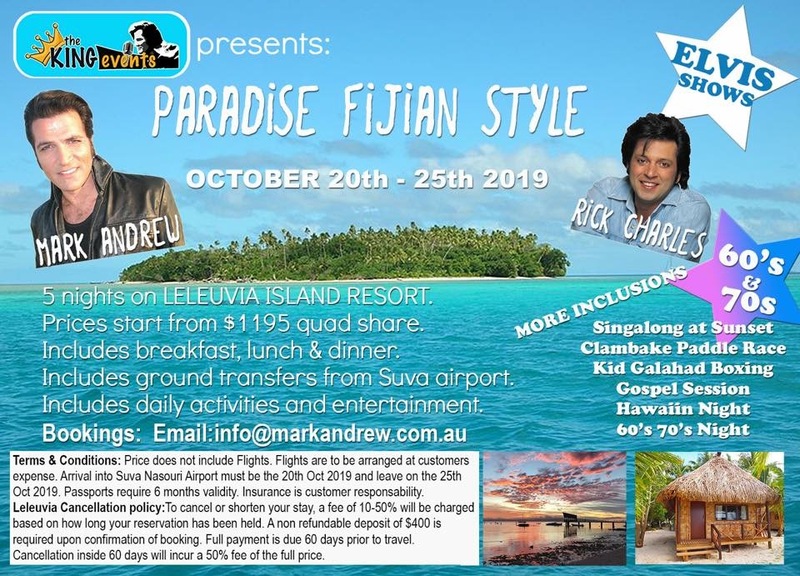 5 nights on beautiful Leleuvia Island , Proud to be working along side Rick Charles Hogg , a wonderful versatile entertainer. Together our forces will be covering 50s 60s 70s and of course loads of Elvis. Not to forget the Fijian experience, the beach, food , fresh air, romantic sunsets. Lots of fun activities and friendly staff on the Island to make your experience a memorable one. Making it like a V.I.P personal event. Shows everyday and fun activities as part of the daily program. Price starts from $1195 pp including Breakfast, Lunch & Dinner. $995 pp for the GI Blues dorm sleeping arrangement. Theme nights will be a highlight as well as the traditional Island welcome & farewell ceremonies. Join our private group page Paradise Fijian Style for more info.